Lasers and mirrors let the Very Large Telescope see much more clearly. One of the world’s most powerful telescopes has been fitted with four lasers and a shape-shifting mirror, allowing it to capture ultra-sharp images of exploded stars and some of the universe’s earliest formed galaxies. Sitting atop Chile’s bone-dry Atacama Desert, the Very Large Telescope has the advantage of viewing space through some of Earth’s clearest skies. But the European Space Observatory, which operates the Very Large Telescope, has found a way to produce even more clarity. The observatory spent 10 years perfecting an instrument called the Adaptive Optics Facility, or AOF, which analyzes and adjusts for the blurring caused when viewing the cosmos through Earth’s atmosphere. The first images have arrived. As this comparison shot shows, it’s like the Very Large Telescope finally went for its eye exam at the optometrist’s. The planetary nebula NGC 6369, also known as “The Little Ghost Nebuala," is over 2,000 light-years from Earth. At left is a before AOF shot, and at right is the improved or atmosphere corrected image. Astronomers often seek high ground for their telescopes, so their instruments look through as little of the atmosphere at possible. Already 8,600 feet above sea level, the Very Large Telescope now has the advantage of capturing images as if it were some 3,000 feet higher up. Young planets are forming in a cloud of gas being shed by a dying star. Known as the Retina Nebula, or IC 2206, it is located some 2,000 light years from Earth. ESO 338-4 is a starburst galaxy, which is a galaxy undergoing intense star formation. Scientists believe this chaotic mass is the collision of several smaller galaxies. The bright spots at center are areas of vibrant star formation. 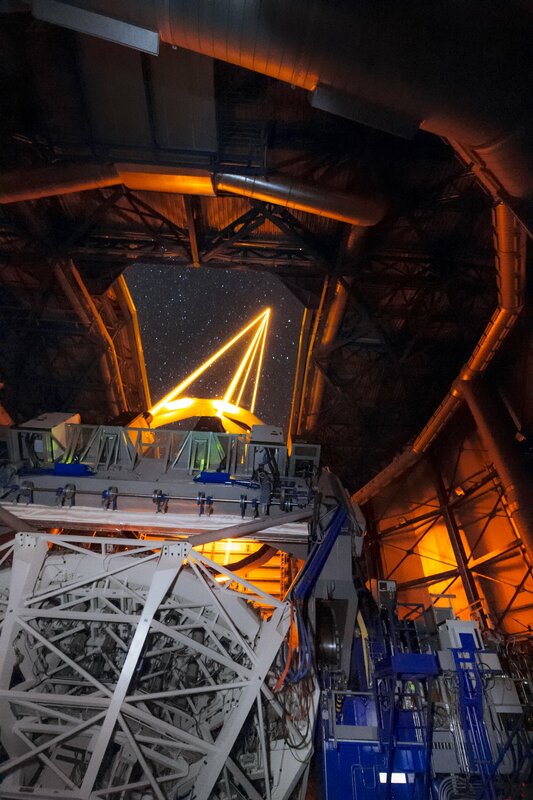 The new adaptive optics technology has been installed on one of the Very Large Telescope’s four 27-foot wide telescopes. The four laser beams shoot into the high atmosphere, making sodium ions glow like distant stars in space. Based upon the blurring of these artificial, laser-made stars, the AOF can discern what’s happening in the air above. The Very Large Telescope's new lasers. Using this atmospheric insight, the telescope’s mirror then deforms and “adapts,” changing shape to correct for these weather disruptions. Essentially, the mirror changes to capture the images as if there were no atmosphere or turbulent water vapor moving around in the higher atmosphere, above the Very Large Telescope. The four AOF lasers shooting into the high Earth atmosphere.